Back in the mid 60's my dad was interested in building balsa planes. Life was great, he had a good job, a nice house, plenty of room to work. And then the kids came into the picture and ruined his fun. Numerous plans he had purchased went into storage, the house filled with toys, pets, etc and decades passed. 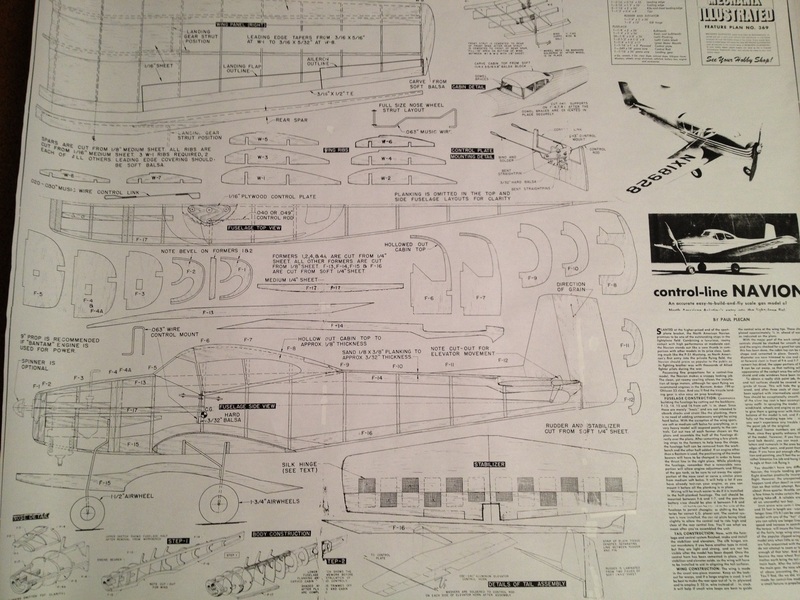 As a kid I remember looking at the plans he had, folding and unfolding them and thinking about building the planes myself. 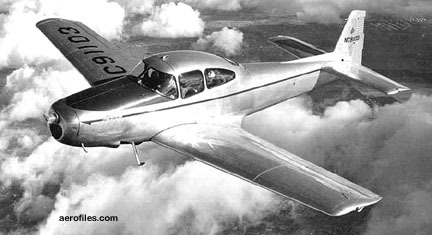 The Navion plan was probably unfolded and folded incorrectly hundreds of times. 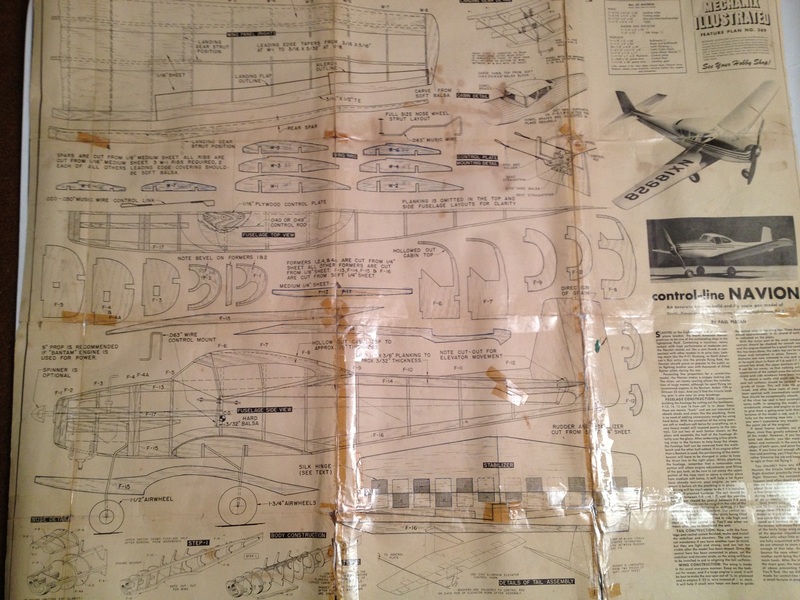 A few years ago my dad gave me the plans as I was getting deep in to the hobby. Sadly, the Navion plan was in bad shape from being handled and poorly folded so many times. I figured it was a lost cause, but there was no harm in trying to salvage them if I could. At the time I worked for a manufacturing company which had an estimating department with large scanners/printers. I taped up the torn sheet taking care to line things up as best I could. The folds were so bad in areas that the paper was long gone. With it taped and ready I had it scanned as a .pdf and was amazed at how well it worked. The pics below show the taped up original and the newly scanned version. 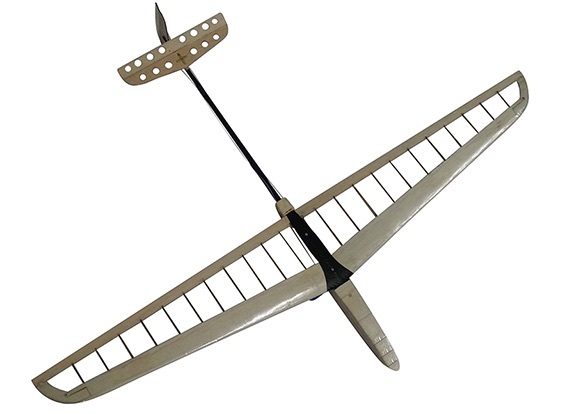 This was absolutely a plane I wanted to build, even though it was designed for control line and we're in the age of RC. 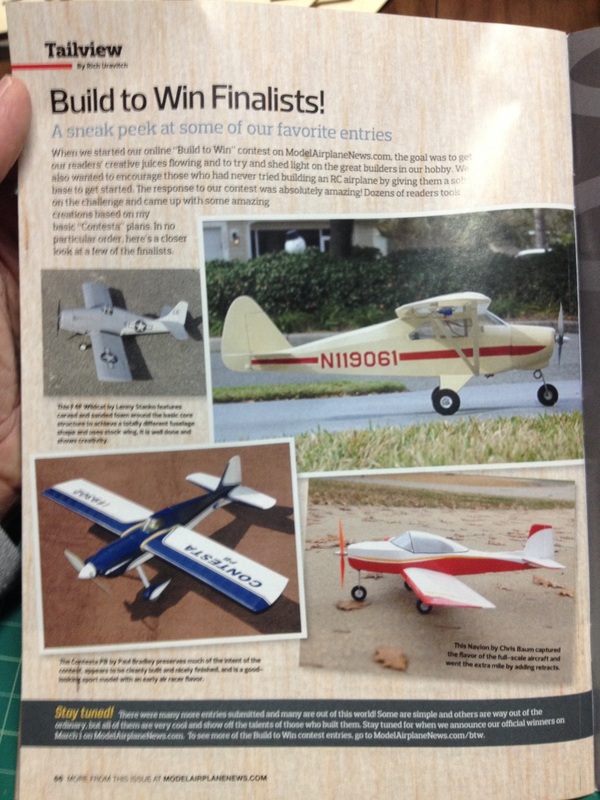 Just over a year ago Model Airplane News held a "Build to Win" contest, where all contestants started with the same generic core design - essentially a low-wing "Stick" - and they created their own masterpiece from there. Searching for design inspiration I pulled out the Navion plan and found it was almost exactly the same size as the Contest Airframe, so I used it for my design. When the contest ended my version of the Navion was awarded Honorable Mention - not too bad for my first real kit bash attempt. 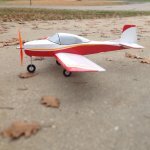 The contest airplane looks a bit like the Navion and it flies well even though it is way too heavy due to the electric retracts and my heavy building techniques. 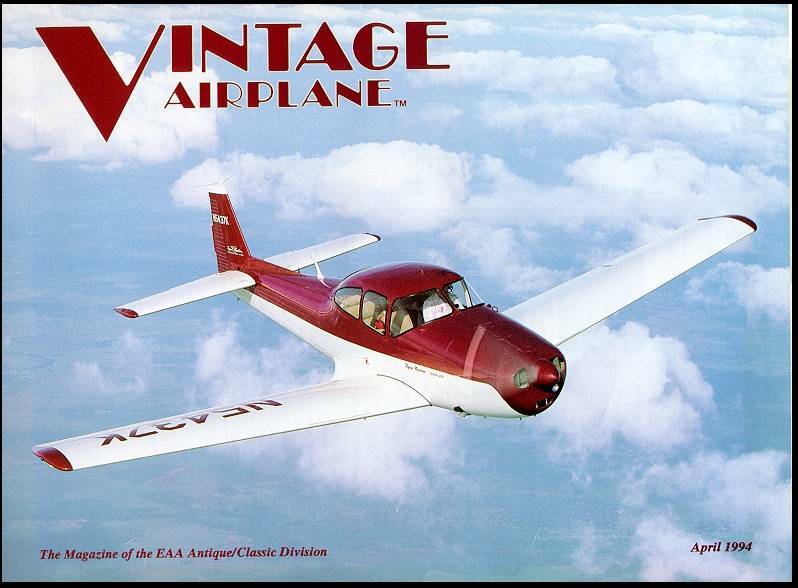 But I still wanted a better version of the Navion, and this contest is giving me the reason to finally build it! It may not be done in time, but it's something I've wanted to do for decades and it's time to pull the trigger. Some of the engineering to update from C/L to RC I've already done, such as making the rudder operable and building the tail section from stick instead of sheet. The plane was never designed to have ailerons so I'll need to tackle that project, along with determining how to add retracts in a plan that never had them. This should be an interesting project for me, so thanks and curses to Willsonman for starting the contest! Looks like a great plane to build. Please consider sending an electronic copy of your plane to Steve at Outerzone. Steve has built one of the most amazing collections of plans, all free! I searched on Navion and did not see your particular model. If any of you builders have not found Outerzone yet, it's like crack for builders of flying models!! I was just looking at his site today to find out how to upload the plans and will take care of that soon. You're right, it's like crack! Wingspan on the Navion is 33". Perfect for the areas I fly. My problem with Outerzone is it's too good of a resource I went there looking for something to build and found too many options, got overwhelmed and put off building anything as a result. I can't just "browse" a site like that safely But it did let me find what I was looking for when I knew what I wanted. It's good that I didn't have free access to the big printers at the previous job or I'd have been fired for wasting company resources! I'm starting this build off with the fuselage. 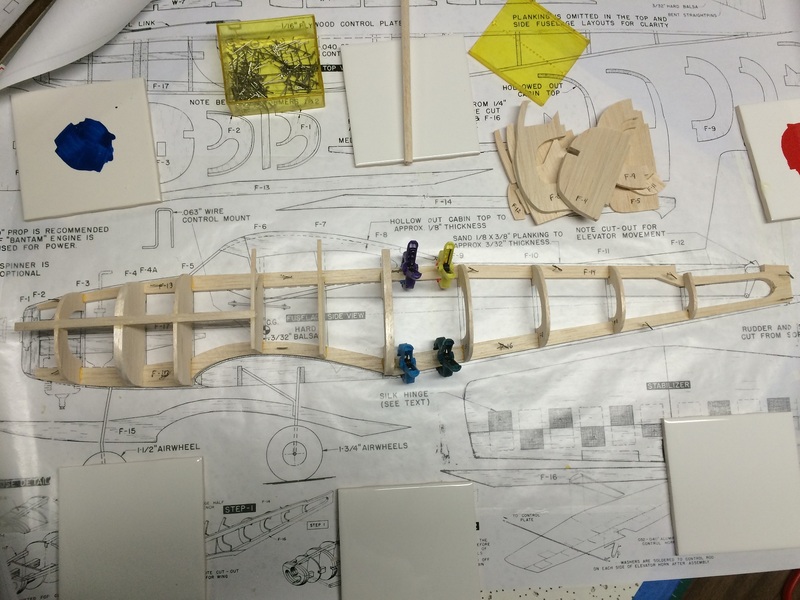 The formers are a mix of 1/8" and 1/4" light balsa, and the plans call for planking the fuselage with 3/8" x 1/8" balsa planks. 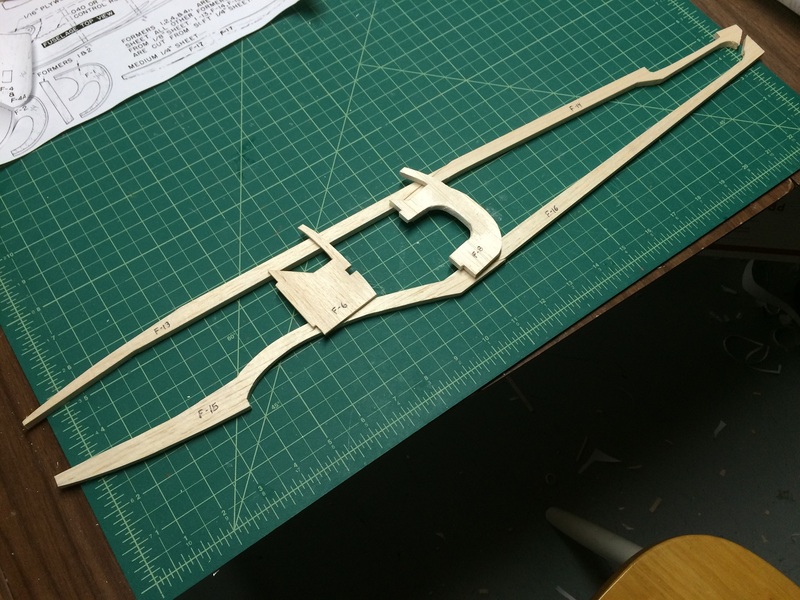 I had some of the 1/8" x 3/8" sticks for another build on-hand and did some test fitting. In my opinion that plank size is jut way too big and wouldn't conform well to the curves of the fuselage. I've got a balsa stripper so I took some 3/32" sheet and made some planks 1/4" wide which work well for much of the planking. When I get to the areas with more curve around the bottom I'll make the planks a little narrower. Once the glue holding the planking applied so far dries sufficiently I can remove the fuselage from the building board and add the formers for the other side. 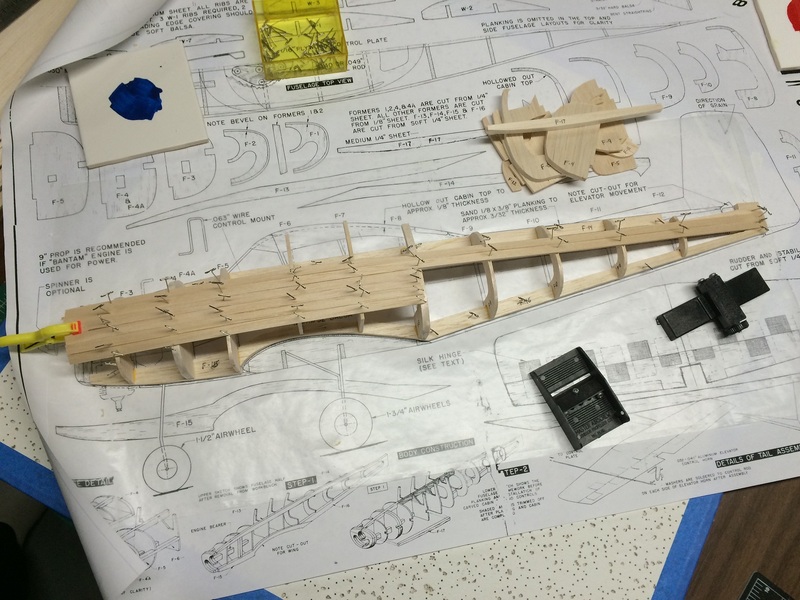 The tentative plan is to eventually cover the fuselage with fiberglass, my first attempt at doing that on any build. 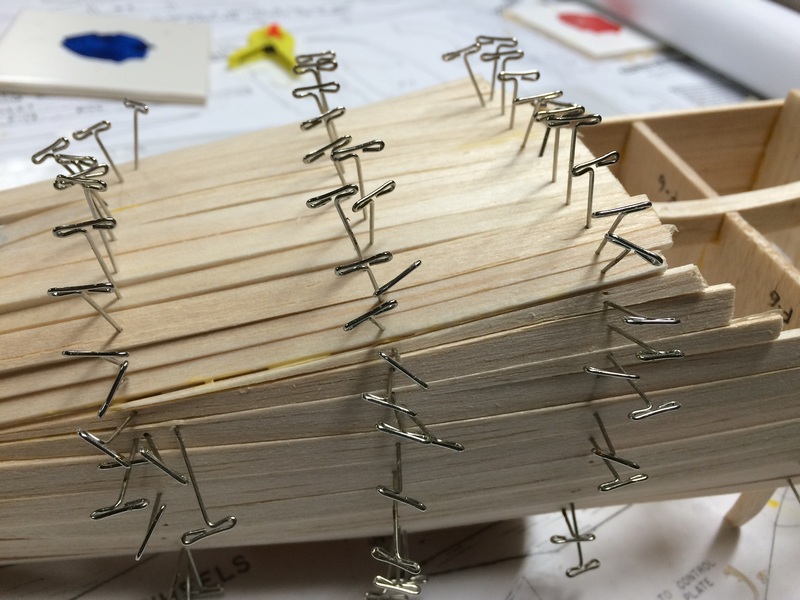 With some planks attached to the first side I could remove the fuse from the building board and install the fuselage formers on the second side. Then, on with the planks! 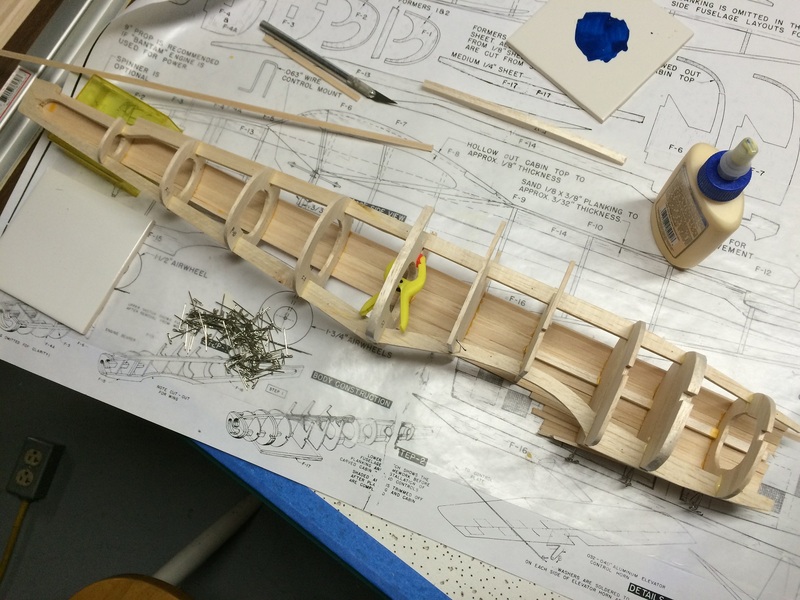 Planking of the fuselage seems to go quickly, but it takes some time. 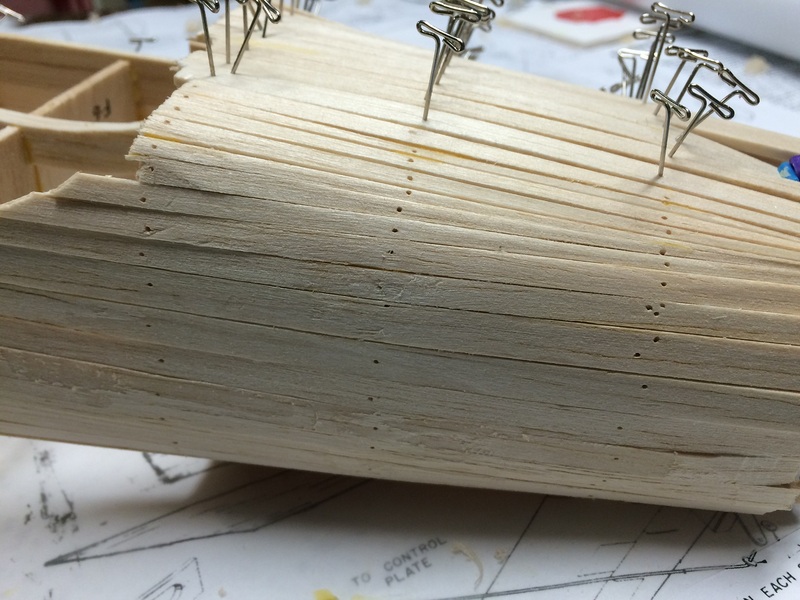 I've seen people plank with surgical precision, but that takes a lot more time and skill than I've got, so I'll end up with more clean-up work when it comes time to finish the fuselage. I use a few different widths of planks, and taper them as needed to fit the gaps as well as possible. When the glue dries and the pins are removed I hit the raised edges with the razor-plane which cleans up the look quite a bit. Some light sanding with a sanding bar refines it a little bit more. At this time I'm not doing a final sanding, but just trying to clean it up a little for my own personal enjoyment. Once the planking is done and the rough sanding is completed I'll break out the filler to take care of all the little gaps. Finish sanding will follow that, along with fiberglassing. I probably should have posted some pictures when I started this thread, but below are pictures of the Ryan Navion. 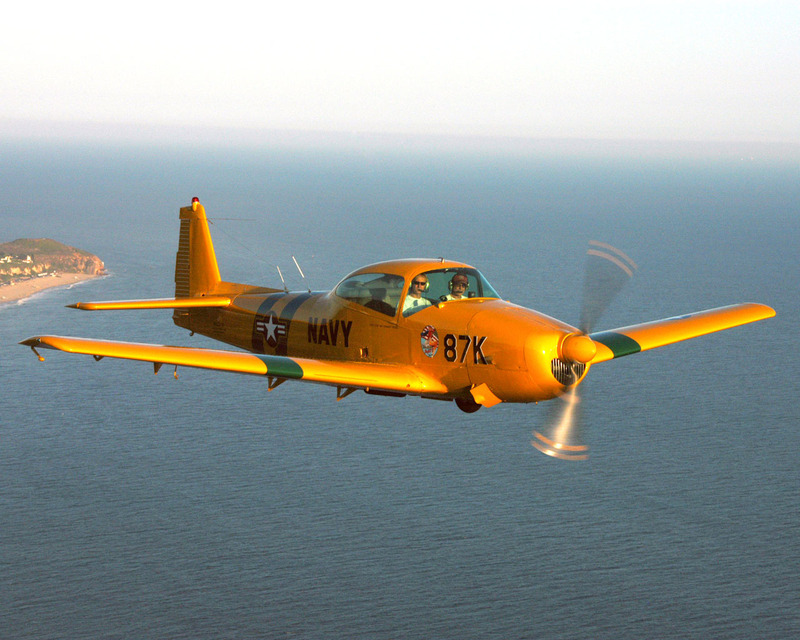 In my opinion, one of the prettiest planes ever designed. It was used in civilian and military roles as the L-17 so the potential for paint and decal work is endless! 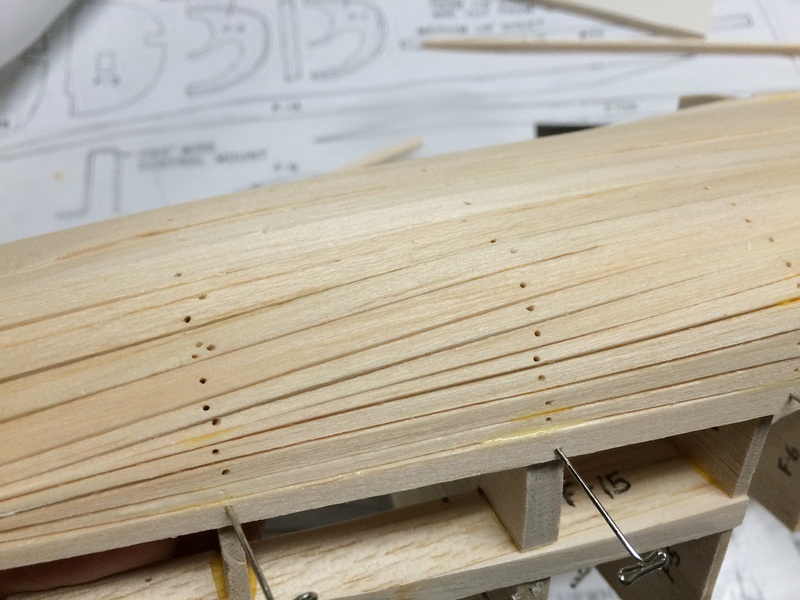 This is the first time I've planked a fuselage and it's an interesting process so far. Since the plane isn't that big the planks are relatively narrow so they can conform to the curve of the fuse as much as possible. Since the fuse also gets narrower at the nose and tail I also have to taper the ends of many planks. These narrow, thin, and tapered planks are VERY easy to break! Especially when the loose end is hanging unsupported such as where the wing will eventually go. I've broken a number of the planks so far and replaced a few planks due to breaks, but the work continues and the fuse is taking shape. By the end of this weekend I want to have the planking all done. Once that is complete I'll work out the details on how the motor, nosewheel (retract? ), etc will go in. The motor won't be an issue, but if I want to put retracts on this plane it's going to take some work! Retracts certainly are an added complicatin. Glad the plane I chose doesn't have any. One of the pictures in your opening post shows the plane on a carrier. Are you planning on fitting an arrestor hook? Balsa addiction is in full bloom, I went and ordered another very cheap Chinese kit. This time the Hobby King 1000mm DLG. This will be my first try with DLG, and hopefully my bad shoulder can take the abuse! Well crap... I went to the LHS to pick up some balsa to cut for planks and when I walked it it looked like the place was getting picked clean. A little digging and I found they're going out of business, so add that to the growing list of places that can't compete in the internet age. It was nice having a place close-by for those last-minute needs, but I'm also surprised they lasted as long as they did. The RC stuff certainly didn't help keep them in business, thanks to the lack-luster effort given by the clerks behind the counter. Usually they'd be there working on people's cars, ignoring people who wanted help with planes, like me. One day I got to wait for help while they talked about what they wanted for lunch. Time for me to get friendly with Balsa USA and other suppliers I guess. Hmmm&#8230;. DLG. You are a bad influence. Brick and mortar 0, National balsa millions. Hmmm…. DLG. You are a bad influence. I justify it by calling it my "chauffeur fee" for driving the family cross country and back for vacation this summer. I was very tempted to try National, but Balsa USA beat them on shipping for smaller orders. National seems to make a lot of sense if you're ordering enough to hit their free shipping. But with their minimum order of $25 I found Balsa USA made more sense for me as I didn't need much and they didn't have the minimum order requirement. I'd love to just order extra for future builds...but funds are tight and that's just not going to happen for me right now.